"The Flame Pearls Pt.1: Attempted Assassination"
"The Theatre Mysteries" is the 13th Mandrake Sunday story. The story was written by Lee Falk and drawn by Phil Davis. Mandrake is to perform at a charity benefit when the famed tenor Faravelli recieves a death note, then dies mysteriously on the stage before a huge audience. 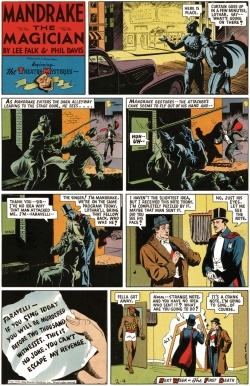 The title for the story is taken from the strip of February 4, 1940 (Beginning - The Theatre Mysteries). This page was last edited on 26 May 2016, at 05:29.